Students are able to repeat a block exam a maximum of two separate times before they have to repeat a block. At the end of every semester, students can purchase an opportunity to write up to two make-up tests. The exception is for fourth-year (and beyond) students; they can take up to four make-up tests at once. 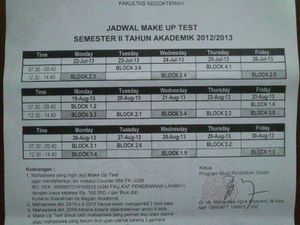 A make-up test schedule is released sometime in the third and sixth blocks of the year. It is usually posted on one of the noticeboards in Grha Wiyata. It is usually too difficult for students to remediate two block exams and perform well on them both. So, it is better for students to purchase just one remedial block exam at a time in order to dedicate their full attention to studying for that particular block exam. The maximum attainable marks in a block after a make-up test is A/B the first time and B the second time. For example, a student that scores 90% on their second make-up attempt for a particular block will be given a B grade. That means, you shouldn't do a make-up test for a block that you have A or A/B in; and shouldn't do make-up a block a second time if you have a B. Only do make-up tests for blocks in which you received B or below (or B/C or lower for second make-up attempts). In comparison, students that repeat an entire block have no maximum grade limit and can get an A if they score well enough. 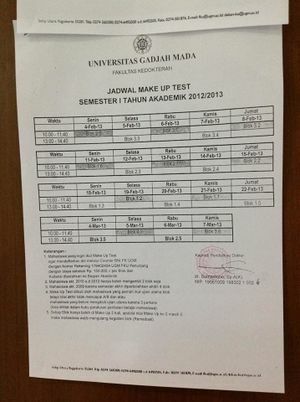 Make-up test registration forms can be obtained from Grha Wiyata. Otherwise: obtain the make-up test registration form from the registration office in KPTU (pictured on the right). After entering KPTU, go straight inside past the BNI Bank window and the registration office will be on your left once you're in the waiting area. Enter the registration office and a box will contain the registration forms for students to take. Select up to two make-up tests to register for (unless you're in fourth-year or beyond, then you can select up to four). Mark these on the registration form. 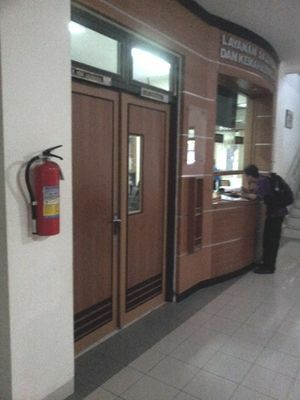 Fill a payment receipt across from the BNI Bank window located just inside the entrance of KPTU. Pay Rp.150,000 per make-up test at the BNI Bank window. The person at the BNI Bank window will return the carbon copy of the receipt with some stamps on it (pictured on the right). Have your DPA sign the make-up test registration form. If you cannot get your DPA to sign (i.e. your DPA cannot be found or is busy), just ask somebody in the administration office in Grha Wiyata to sign. Next to the DPA's signature, put in your own signature. Take the payment receipt, make-up test registration form, and a passport photo (3x4 size) to KPTU to complete registration for the make-up block exam(s). Visit Grha Wiyata again a day or two before your make-up exam to pick up your exam card. You do not need to repeat your lab exams unless your transcript shows a "K" (which stands for "kosong" in Indonesian, meaning "empty"). Go to the administration office in Grha Wiyata to ask them why you have a "K". Usually the reason is that you have not completed a requirement to pass that block, and often it is a lab exam that you failed. Lab exam remeds are organized by the particular lab office. So, for example if you failed Biochemistry, go to the Biochemistry office and ask them when the remed exam is. If there is no scheduled remed exam, ask them to organize one. It is often possible to request a lab exam remed for a block that has already passed (e.g. 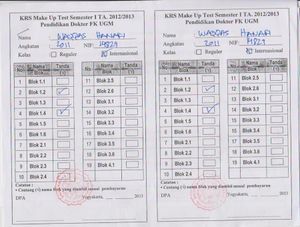 request a lab exam remed for block B1 during block B4). This page was last edited on 24 May 2016, at 20:55.